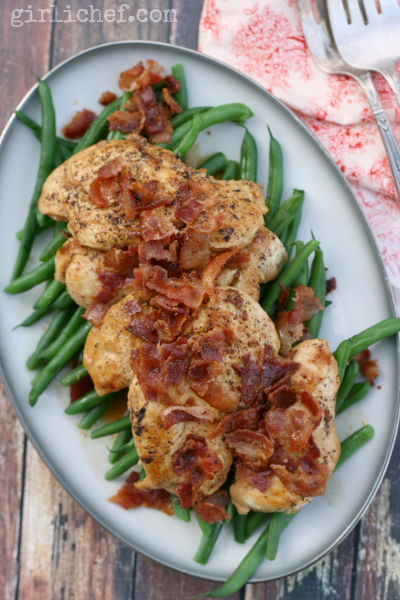 Juicy chicken infused with the flavors of bacon and garlic. The end. 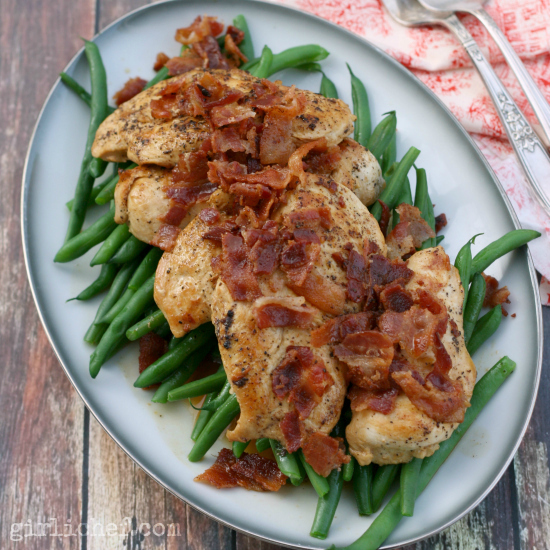 Both this juicy chicken and the tender-crisp bed of green beans it is perched on are infused with the flavors of bacon, garlic, and white wine . The end. I don't know about you, but either of those sentences would send me flying to the dinner table. The same is true for my family. This is such an incredibly simple meal. I mean, four ingredients (plus a little salt and pepper). Five ingredients if you count the green beans, which are a side dish and entirely optional. I recommend just thinking of them as part of the process. 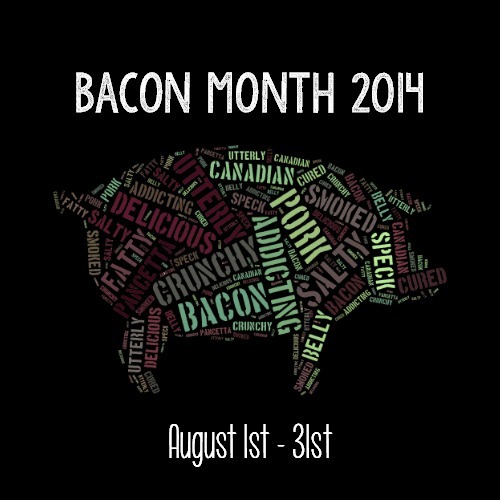 I mean, swirling them around in the bacony sauce that smothers everything is a blissful bit of magic all in itself. So, five ingredients plus salt and pepper, AND it's on the table in 30 minutes. Go ahead. Make it for dinner tonight. I don't know if you're convinced, but I'm mentally scanning my fridge. I find myself very persuasive. Yes, the taste is what makes it a family favorite, the ease is just a happy bonus. 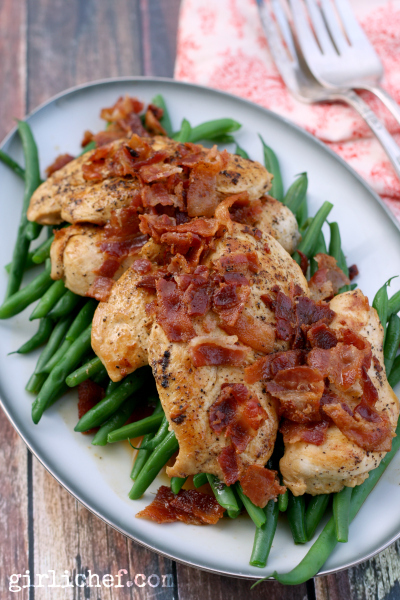 Juicy chicken infused with the flavors of bacon and garlic, set atop a bed of tender-crisp fresh green beans. 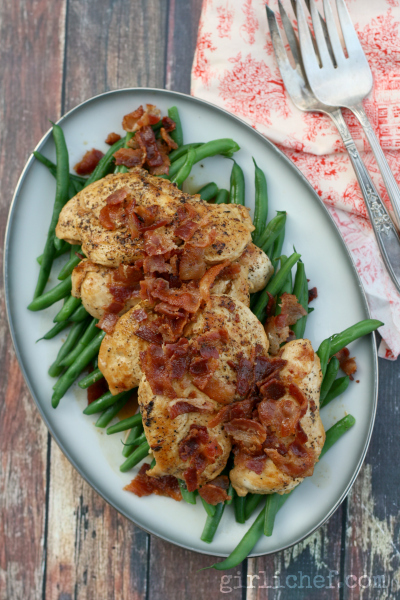 Have this family favorite on your table in 30 minutes! Cook the bacon over low heat in a 12" cast iron skillet until cooked through. This takes me about 15-20 minutes because I like to cook bacon low and slow. Remove the bacon to a paper towel-lined plate. Pour all but about 2 tablespoons of grease from the pan (reserve extra for another use). When cool enough, run your knife through the bacon a few tiimes until you have large pieces; reserve. Add the garlic to the pan, and allow to cook for 1-2 minutes, moving it around from time to time. Season the chicken lightly with salt and liberally with black pepper. Push the garlic to the sides of the pan, then lay the seasoned chicken breasts in the pan, taking care not to crowd the pan (do it in two batches, if necessary). Let cook until golden on the bottom, 2-3 minutes, then flip and continue to cook until just done, another 2 minutes or so. Remove the chicken to a plate. Carefully add the wine to the pan and cook, scraping the beautiful bits from the bottom as you go. Let the wine bubble up and reduce by at least 1/3. Arrange the chicken on a serving platter. I recommend cooking some fresh green beans and laying those down as a base for the chicken. Pour the sauce from the pan over the chicken breast (it's tastes amazing over those green beans, too). Scatter the reserved bacon over the top and serve. Traditionally scaloppine is lightly floured before cooking. If you'd like to dip the chicken cutlets in flour after seasoning, by all means, do so! This will thicken up the sauce slightly, as well.